Austria Piatnik Standard English Patience 44mm x 65mm c1960. 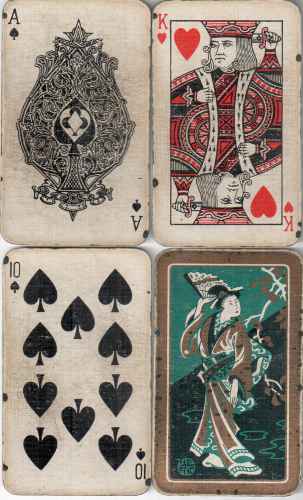 Double deck of 52 playing cards in each deck (lacks Jokers) original slightly damaged cloth box, cards in very good condition. 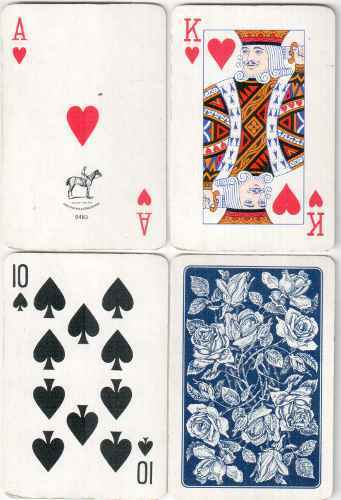 Austria Piatnik Standard English Patience in original card box Roses Patience Playing Cards - Kingsbridge New York No.23 Complete pack of 54 playing cards including 2 Jokers in original slightly damaged box, cards as new. 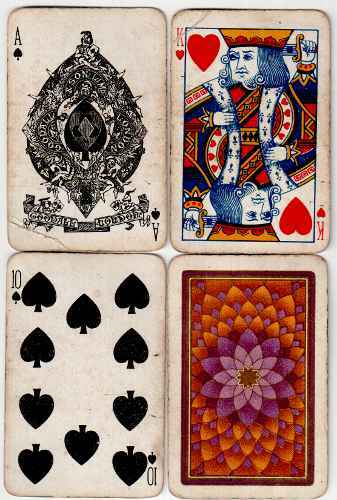 Card size: 44mm x 66mm, box size: 47mm x 67mm x 18mm. Engalnd Patience size standard English Double deck Chinese Geishas c1940. Lacking Jokers 52 playing cards in each deck. Used and soiled cards in original damaged box. England "Fleveco" Clifford Series Complete pack of 52 used playing cards in very good condition, in original damaged box. 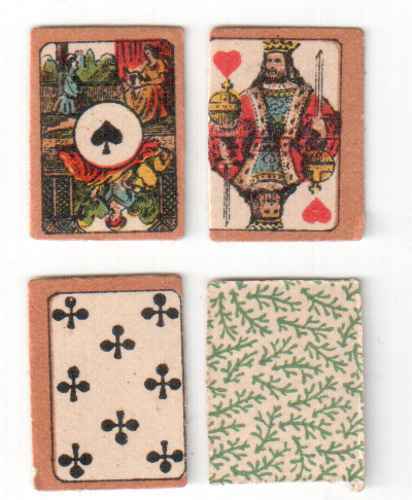 Cards: 29mm x 40mm. Box: 32mm x 42mm x 30mm. England Goodall London. 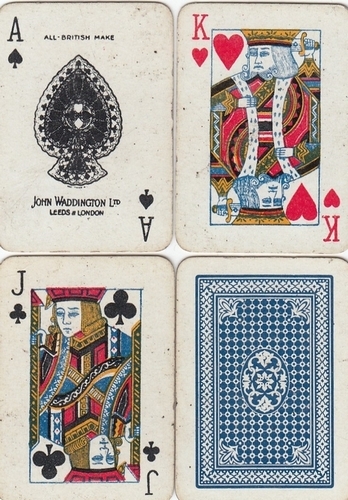 Patience Size Playing Cards. c1920. Complete pack of 52 used playing cards. Size: 45mm x 68mm. England Goodall London. 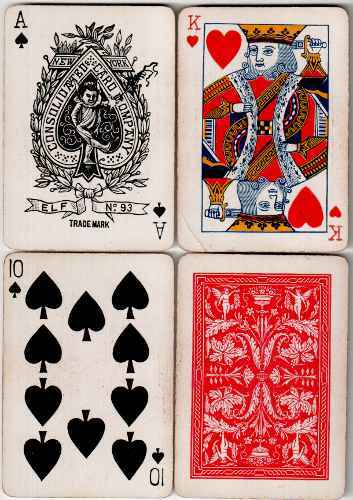 Patience Size Playing Cards. c1920. 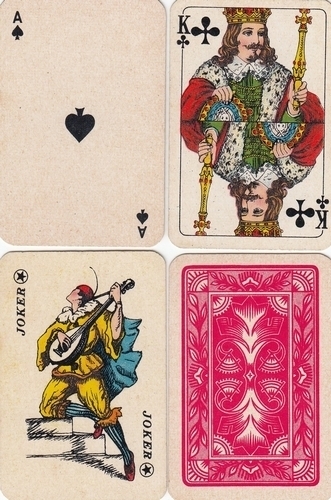 Complete pack of 52 playing cards. Used in very good condition. Size: 45mm x 68mm. 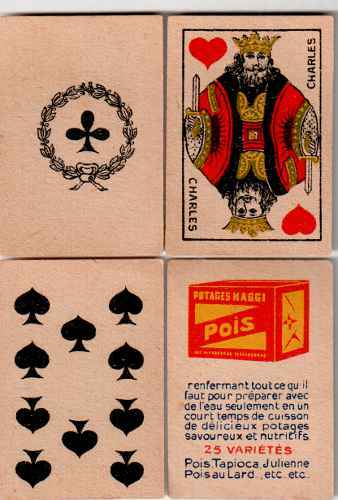 France Pottage Maggi Pois - Playing Cards c1900 complete 32 patience size 36mm x 50mm playing cards French Paris Pattern without indices and square corners on poor quality card. Reverse advertising Soup cubes with text in French. Excellent condition. Primitive look. 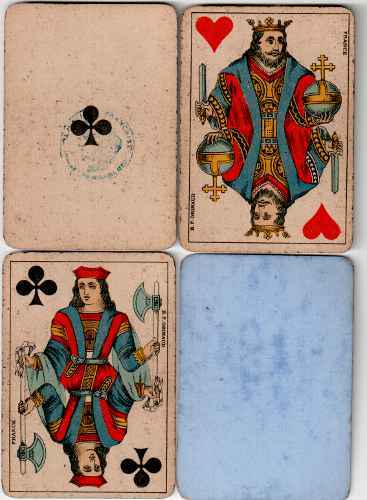 France Grimaud 'Genovese' Pattern wide patience cards 46mm x 53mm 1889 tax stamp on Ace of Clubs complete 32 cards with reversible courts and no indices Kings with sword and sceptre. Plain blue backs used lightly soiled wit hour damage in good condition. France Grimaud Variant Belgian Pattern c 1900. 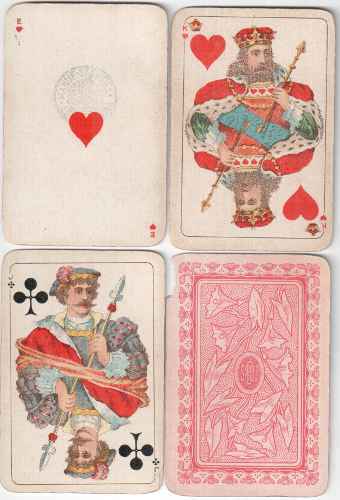 51 of 52 playing cards (lacks QC) in excellent condition with golden edges without a box. Size: 39mm x 57mm. 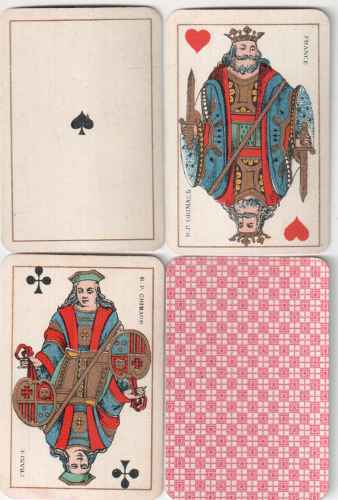 Swedish Standard patience size 44mm x 68mm Swedish suited quaint designs complete 55 cards with three Jokers lacks box in excellent condition. Germany Wust Doll's House Thumbnail Cards Incomplete 49 of 52 cards (lacks 9S, 3S & JH) c1860 miniature decorative scenic Aces and borders on pips. Used for doll's houses in excellent condition leaf pattern on reverse. 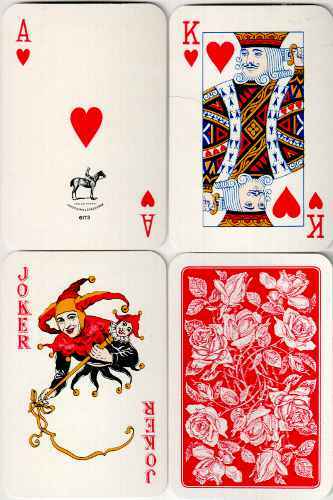 H. Fournier S.A. Vitoria Made in Spain 201 Avion Patience Playing Cards Complete pack of 54 playing cards including 2 Jokers in original box, cards in excellent condition. Size: 37mm x 57mm. Box: 39mm x 59mm. 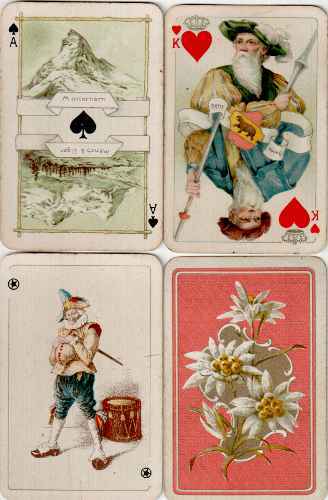 Switzerland Muller Souvenir Patience Playing Cards Complete 52 cards plus Joker wide patience size 50mm x 76mm x 15mm reverse floral pattern on gilt orange background. 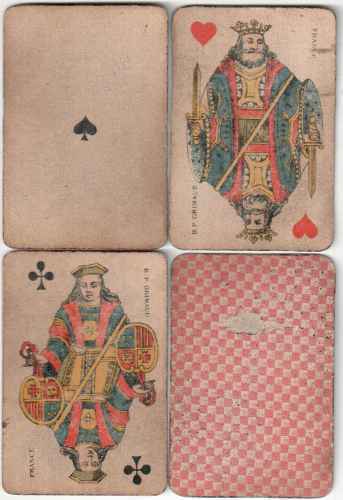 Attractive depictions of named views on the Aces: Lucerne, Geneva &c and costumes of the named Swiss cantons on court cards: Freiburg, Zug, Appenzell &c. Used and soiled in very good condition.